A prestigious accomplishment awarded to the top remodeling projects in the Kansas City area, the 2017 REMY Awards celebrated the best the industry has ever seen. Judged on a 90 point system that includes project overview, before and after photos, budget considerations, overall aesthetic appeal, and communication with the homeowner, the winners of the 2017 awards created and executed impeccable designs, including a bath remodel by Mission Kitchen and Bath. With sleek lines, chic colors, and an open concept, this remodel was inspired by European wet baths, giving the master bath an elegant, elevated aesthetic. 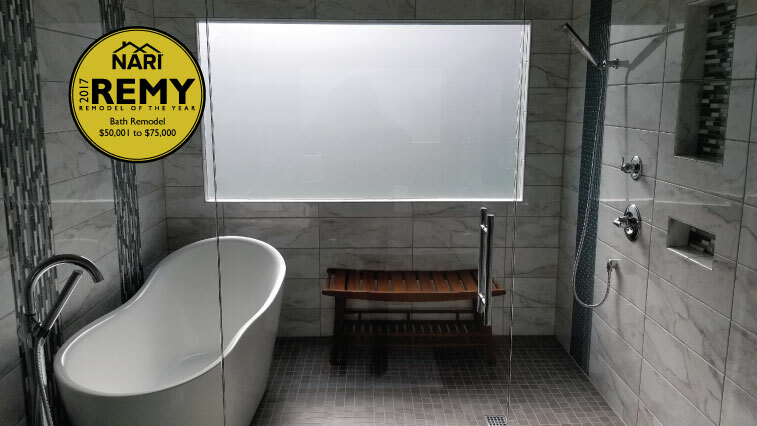 Enclosed behind wall to wall glass panels and a hinged door, this winning remodel showcased the trending design of a freestanding shower and tub area, which opened up the space considerably, and added modern flair to the design. Boasting improved storage and symmetry within the space, a new vanity and linen cabinet in the remodel helped to give practical use while remaining true to the overall style and inspiration of the bathroom. Through the use of soft blue and gray tones as well as three different decorative glass tiles, this bathroom was transformed from a dull master bath into a spa resort. Mission Kitchen and Bath brought new life into this master bathroom with expert planning, design, and execution, and is honored to be among the incredible 2017 REMY Award winners. To learn more about this REMY Award winning remodel, contact Mission Kitchen and Bath today.